The Solitaire will engage you from the first glance with its unequalled attractive design. 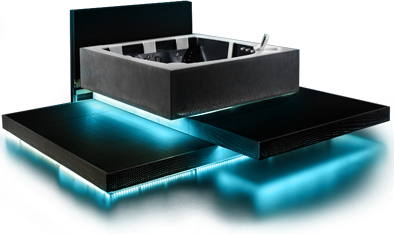 The minimalist shapes, sophisticated hydrotherapy setting and the game of lights promise the perfect experience. 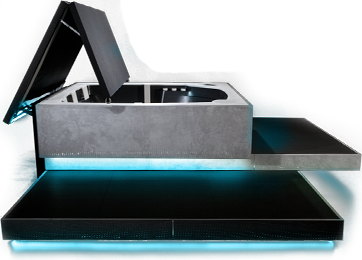 The spa’s shell, formed from top-quality acrylic, is complemented by the modern and durable designer material Corian®. The smooth, elegant top, made from noble material, defines the form of the entire spa, organically blending in with the spa interior through its functional elements. The attractive Corian® is also featured on the control valves and display box. The embedded Corian® seats can be easily moved, thus stretching the seat and creating an individual setting for users of different height. The patented Body Set System® offers a new level of comfort, resulting in a perfect relaxation experience. The bench seating is also created from Corian®, expanding the interior space in a non-traditional way. Even one look at the Solitaire and you’ll be carried away. Academic sculptor Petr Slanina graduated from the Art and Crafts School of Uherské Hradiště and the Academy of Arts, Architecture and Design VŠUP of Zlín. 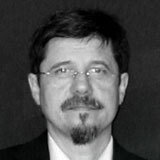 His cooperation with the company started with a project of specially shaped bathtubs - Mini Spa, whose unique design is protected by patent rights. Since 1998, Petr has been permanently employed with USSPA. He benefits from the great experience he acquired in practice in the Czech Republic as well as abroad. His style is a pure line and functional perfection. Fascinating force is hidden in seeming details. One single touch and Solitaire gives you the proof. The Solitaire features a cover designed by an original patented construction which provides excellent insulation and uses the unique Automatic Cover System ACM® lifting mechanism. The cover system reminds of a roof of a convertible, it is controlled completely just by a single button. No more of clumsy handling, no need for storage space, the relaxation has an effortless access now. Solitaire uses the most modern technology to make it possible. Thanks to the swiveling touch screen display, the controls are always within reach. The new generation of software provides your spa with the utmost of care, whether you’re using it or not. If you really wish to relax, you shouldn’t be distracted by any interruptions. That’s why the Solitaire is equipped with a large 10.4‘‘ swivel touch screen display enabling you to direct all of your spa’s functions simply and intuitively. The LCD display lets you control not only the basic functions such as massage, lights, temperature settings, energy saving modes, date and time, but an entire array of completely new practical functions. The display brightness automatically adjusts in relation to the intensity of the surrounding light. The Intelligent Spa Management developed exclusively by USSPA is based on spa manufacturing and care experience, and presents you with unprecedented comfort. The ISM® system continuously evaluates the spa’s use and uses the gathered data to modify parameters such as filtration intensity, ozone purification, manages energy efficiency, and more. This results in a marked ease in maintenance, also presenting the user with a new generation of functions unprecedented in spa technology such as a guide features, alarms, and operation analysis. The ISM® system also allows the spa to be controlled remotely for service or even repair, as well as integration into control systems for home automation. Solitaire's operation can be integrated into an automated home system and can even be controlled from a different country. That means that your spa can be ready all the time or exactly when you want. What's more, the remote access to the Solitaire operation system means that our service department can respond even before you realize that your spa is in need of service. The philosophy of the Solitaire allows it to perfectly adjust to your lifestyle or architectural visions, becoming a harmonic part of your home. The composition of terrace floors smoothly guides users to enter the spa and it also provides a space for sitting and lying in different high levels. Timless black tartan in combination with huge format of concrete boards with optic fibres. The luminous motive inspired by flowing of air and water offers elusive view through the shape and shows waves, their movement and spreading. Identical solution in matter, however absolutely unique thanks to the diferent materials. The steps from natural Thermowood and sideboards from masive processed sandstone. It gives the impression of smooth velvet and opens the space to the fantasy. Not just the color of the acrylic can be selected specifically to your requirements. Even more so you can adjust the Corian® components, which are available in a wide range of colors and shades. The combination of acrylic and Corian® makes for a countless number of color variations. The revolutionary construction of the Solitaire allows for a practically unlimited choice of encasement. Material, color, structure – it can all be adjusted to just about anything you desire. The Solitaire can also be supplied in a form prepared for individual embedding. You can also choose from collections of prepared solutions created by renowned architects and designers. Spa as a piece of art. The displayed version is the prime model of the collection by MOLO Architekti. It brings new materials into the world of spa such as concrete illuminated by original graphics of optical fibers and tartan. New dimensions were opened. 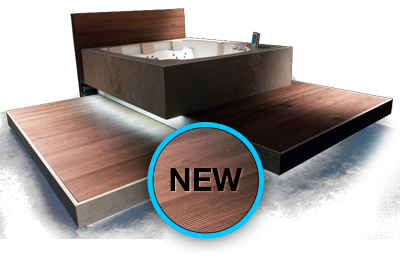 The completely new spa opening mechanism allows for an unprecedented degree of individual cover designs and styles. There are several designers’ collections of styles to choose from, but it can be produced according to your individual desires, or perhaps that of your architect’s.